In other words, together China and India have about 8 1/2 times the number of people as the United States, and, according to the Population Division of the Department of Economic and Social Affairs of the United Nations Secretariat, they make up almost 40 percent of the world’s total population. This detail becomes particularly important when we explore the question of outsourcing. With all those people, China and India can absorb a virtually unlimited number of outsourced U.S. jobs. 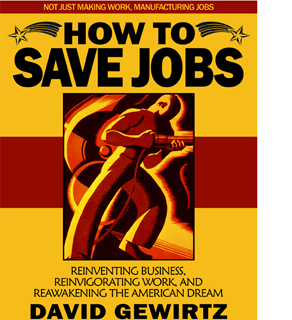 After all, according the Bureau of Labor Statistics, only about 154 million adult Americans work, 10 million are unemployed, and about 80 million are considered to not be in the labor force for one reason or another. 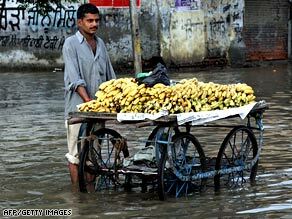 A banana vendor stands on a flooded street as he waits for customers in Amritsar, India, on August 13. Put another way, China and India can absorb our entire labor force demand 10 to 20 times over. That effectively blunts the various assertions pundits have made that there aren’t enough qualified people in those countries to do our jobs. The fact is, if even a fraction of their people are qualified to do the work we do here in America, that’s more than enough to do every job we would possibly need done here in America. More people in China and India are starving than the U.S. has people. Today, America’s Gross Domestic Product is about twice that of China and four times that of India. In other words, we output more goods and sell more stuff. But that’s going to change. Fair warning: this chapter is going to have a lot of numbers. Those numbers that tell a very scary story. I’m going to ask you to read along with me and think about the numbers I’m presenting. These numbers represent the very heart, the very core of the challenge facing us as a nation. Honestly, before I started running the numbers, building the computer models, and seeing the results, I had no idea just how overwhelming a challenge we’re facing here in America. So, if we’re going to make a change, or even if we just want to understand why tectonic change is happening, we all need to understand the numbers. I promise it’ll be an interesting and wild ride. Strap in and hang on. Think about it. We all want a good life. So do workers in China and India. If you recall from a previous chapter, almost five times as many Chinese and Indian citizens live on less than $2 a day than there are people living in the United States. Like those of us in the U.S., individuals in China and India (and other developing nations) want a better life and, like every individual on the planet, they deserve to have the best life they can. So, when you hear that Indian and Chinese workers are hungry for jobs, they are. Literally. Most workers in China and India want and need to increase their standards of living. Unlike what they lived through for much of their lives, their governments now recognize that having a strong middle class is a strategic national advantage - and quite possibly the only way to stop the slide into economic doom they were facing just a few decades ago. In 1970, nearly 50 percent of China’s billions didn’t have enough food to eat. While that number has improved to a “mere” 12 percent, according to the Food and Agriculture Organization of the United Nations, that still means that 162 million Chinese citizens are dangerously undernourished. The U.S., like most of Europe, has less than 2.5 percent of its people going hungry. Think about it: more people in China and India are starving than the U.S. has people. So, when you hear that Indian and Chinese workers are hungry for jobs, they are. Literally. And that’s why the Chinese and Indian governments are educating as many people as they can afford to, building factories, seeking foreign investment, and doing everything they can to get their people into what is becoming an actual middle-class workforce. More on what that means to us here in America next week. we are wrecking this world and we are not seeing it. god help us. Other nations, other people may be hungry for jobs, yet our people, our nation is youngry as well and we have found our selves consumed to the coastlines of our nation, watching the sun rise or set in outsourcing our opportunity to help not only ourselves but others as well. What is going to rebuild our own community realistically and not through massive government spending to sustain the bulk of our economy with "magic" money fresh off the press like a crisp creme to cure our consumption.